long-shafted instruments), to implant an inflatable silicone band into the patient’s abdomen. Like a wristwatch, the band is fastened around the upper stomach to create a new, tiny stomach pouch that limits and controls the amount of food you eat. It also creates a small outlet that slows the emptying process into the stomach and the intestines. As a result, patients experience an earlier sensation of fullness and are satisfied with smaller amounts of food. In turn, this results in weight loss. hospital stay and quicker recovery. 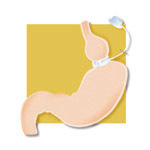 If for any reason the LAP-BAND System needs to be removed, the stomach generally returns to its original form.